Most people know their sun sign. They read the quickie horoscope in the paper and that’s it. There’s so much more to the stars and how they help to guide and influence. It can be pretty confusing and there are some easy ways to begin to understand this ancient art. Of course, begin with the obvious: there are 12 signs in the zodiac. The ancients divided the night sky into 12 segments. Generally the chart begins with Aries, on March 21st and runs through to Pisces which ends on March 20th. Each sign has about a month’s duration. Next, the signs are assigned to one of the four classic elements — Fire, Earth, Air and Water. Fire and Air signs are extroverted signs. Water and Earth signs are introverted signs. The Fire signs are: Aries, Leo and Sagittarius. Fire represents one’s desires and creative energies. The Earth signs are: Taurus, Virgo and Capricorn. Earth represents one’s material resources, environment and possessions. The Air signs are: Gemini, Libra and Aquarius. Air represents the intellect and one’s ability to reason and communicate. The Water signs are: Cancer, Scorpio and pisces. Water represents imagination, human feelings and one’s ability to love and sustain. With those core tenets understood, astrology begins to make more sense. It still will feel pretty generic until you peel back further layers. To really understand the horoscope, we need to talk about birth charts. The exact position of the planets and stars at the time of your birth matter. How the sky looked overhead, over your head, as you were born are crucial in understanding what the stars say about you. We’ll delve deeper in another post, but suffice to say that your Sun sign, your Moon sign and your Ascendant say tons about you. If you can master the basics above and understand the Sun, Moon and Ascendant planet, you can count yourself better than 99% of the population. – Aries (The Ram) (cardinal, fire, personal): In astrology Aries is ruled by the planet Mars. The tropical duration of Aries is March 21 to April 20. – Taurus (The Bull) (fixed, earth, personal): In astrology Taurus is ruled by the planet Venus and for a few modern astrologers, the dwarf planet Ceres. The tropical duration of Taurus is April 21 to May 20. – Gemini (The Twins) (mutable, air, personal): In astrology Gemini is ruled by the planet Mercury. The tropical duration of Gemini is May 21 to June 21. – Cancer (The Crab) (cardinal, water, personal): In astrology Cancer is ruled by the Moon. The tropical duration of Cancer is June 22 to July 22. – Leo (The Lion) (fixed, fire, social): In astrology Leo is ruled by the Sun. The tropical duration of Leo is July 23 to August 22. – Virgo (The Virgin) (mutable, earth, social): There is some debate in regards to a modern ruler of this sign with Chiron, Pallas, Vesta and Ceres often considered candidate by some modern astrologers, but the planet Mercury is typically used as the default by tradition pending a consensus among modern practitioners; but no one knows if or when this will be. The tropical duration of Virgo is August 23 to September 22. – Libra (The Scales) (cardinal, air, social): In astrology Libra is ruled by the planet Venus. The tropical duration of Libra is September 23 to October 23. 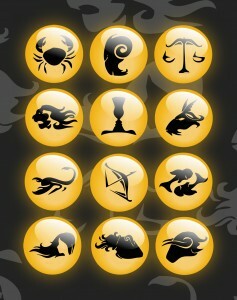 – Scorpio (The Scorpion) (fixed, water, social): In astrology Scorpio is ruled by the planet Pluto. The tropical duration of Scorpio is October 24 to November 22. – Sagittarius (The Archer) (mutable, fire, universal): In astrology Sagittarius is ruled by the planet Jupiter. The tropical duration of Sagittarius is November 23 to December 22. – Capricorn (The Sea-goat) (cardinal, earth, universal): In astrology Capricorn is ruled by the planet Saturn. The tropical duration of Capricorn is December 23 to January 19. – Aquarius (The Water Carrier) (fixed, air, universal): In astrology Aquarius is ruled by the planets Saturn and Uranus. The tropical duration of Aquarius is January 20 to February 19. – Pisces (The Fish) (mutable, water, universal): In astrology Pisces is ruled by the planets Jupiter and Neptune. The tropical duration of Pisces is February 20 to March 20.